Please be reminded that your Angels are nearby. Ask for assistance, share your heart and open up. Be willing to accept help from others and be courageous enough to reach out. If you ask the Angels for a solution, for comfort, for help, you will find that suddenly options are opening for you. 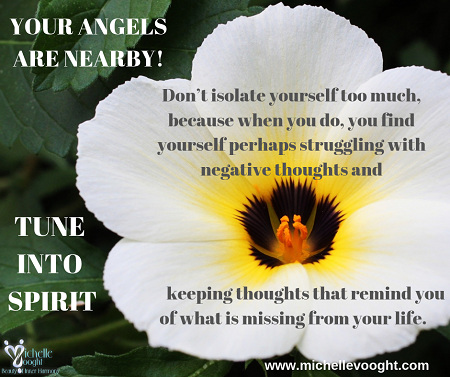 Don’t isolate yourself too much, because when you do, you struggle with negative thoughts and keeping thoughts that remind you of what is missing from your life. Tune into Spirit. Your Spiritual Helpers and friends or family can help you too, to refocus your thoughts. Unburdening in prayer allows you to feel better and think differently about what you are going through. Reach out and be willing to accept help. When you are honest about what is missing from your life, then you can be clear about where you are needing support. Change your thoughts to what is possible, change your thinking to see the silver lining, opportunities and open up to friendship, love and support.